Hello there. You may notice I have a new obsession up on the top left. Unless you happen to be viewing this in your reader. In which case you won't see ... so I'll just tell you. I've swapped my 'Wedding' obsession for 'Art Journal'. Mainly because I got married (yay) and now we are back from our honeymoon (boo) I've been quite into scrapbooking. Well maybe. 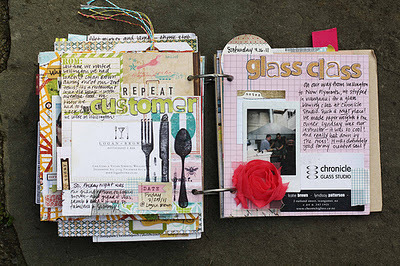 More like scrapbooking in the old fashioned way. I've kept sketchbooks for a long time. They are like notebooks where I keep my ideas and lists. Sometimes I stick tickets and things in them. Sometimes I draw. I've been following a group on flickr for a while where people add their sketchbook pages and more recently I've found similar on Pinterest (isn't Pinterest great?). Its very inspiring to see other people's work. I started looking for more examples of sketchbooks with bits of things taped in but with a less rigid feel than modern scrapbooking. Somewhere between keeping a sketchbook, journaling and scrapbooking I found 'art journals'. The journals which appealed to me most were ones where people made them without a book as a basis. They just start collecting pages together and it takes shape by itself. This reminded me of the way I used to work in college. 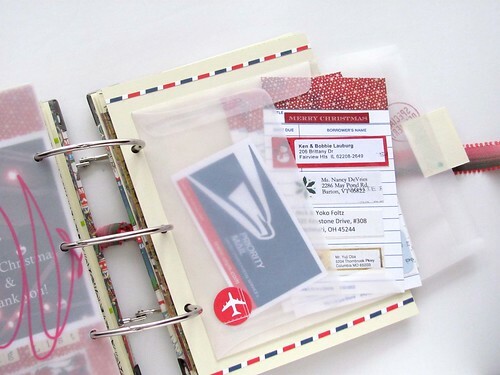 I'd keep all my notes and bind them up at the end of a project. You have less to carry and aren't restrained by one size or kind of paper. These are also less formal and because it is more of a journal than an album there is less pressure to get everything 'right'. My pages are still taking form, but I might share a few once I really get going. In the mean time, if you like these, I've collected a few more of my favourites on a Pinterest board. I love Pinterest. Did I mention that already?